A Pisces woman is a complex and dreamy creature. Her empathy is all-powerful, and it makes her the most likely confidant when a friend or even a stranger has a problem. Pisces feels things other people never can because of the depth of her emotional nature. The fish swims in deep and shallow waters. Those waters are as endless as her emotions. She sees and feels things that go beneath life's surface like the mysteries and secrets that elude many seekers. This innate ability gives Pisces a unique perspective of every day happenings, but it also causes her anguish since so few people understand her in-depth perception of life. It's no wonder others constantly seek her advice and counsel. Two of the most alluring traits of a Pisces woman are her sensuality and dreamy nature. All a man has to do is look into her eyes, and he's instantly lost in a sea of mystery and enchantment. Her physical movements imbue feminine grace to her every gesture and are fluid as though she's moving through water. The man lucky enough to win her heart will be greatly rewarded with deep love and undying devotion. Her romantic soul will seduce him, but it's her readiness to give whatever it takes to preserve love that wins his heart. She's sincere and wants only what is best for her lover, even if it means self-sacrifice to ensure he has it. Her sensitive nature gifts her with the incredible ability to understand and empathize with her lover's feelings and desires. Pisces has to shield herself from empathic overload. Even though it's natural for her to feel so deeply, Pisces can contain only so much emotion before it overwhelms her. If she's lucky, wise parents helped her cope with her emotional nature early in life. Meditation comes easily to Pisces, so yoga and other practices that incorporate the union of her entire being will strengthen her against the flood of feelings she must weather throughout life. The karmic path of a Pisces is stormy at times because she receives so much emotional information from others. Her compassion for their plight can haunt her and even torture her if she hasn't trained her mind to work in unison with her spirit and body. Her greatest challenge in life is learning how to cope with so much sensory information. If she hasn't mastered helpful techniques, her dreamy spirit may seek other ways to cope. In fact, one of the biggest pitfalls for Pisces is turning to drugs and alcohol as coping mechanisms. It's not surprising to find a Pisces woman in a humanitarian service career. Her need to reach out to others in want and pain draws her to careers where she can be of service. It may take her a while to figure out her life path since she is the receiver of a world of possibilities, but eventually she'll find her place and excel in whatever she undertakes. Even if her job isn't one of serving others directly, her extracurricular activities definitely will. Her need to help others must be expressed. A Cancer or Scorpio is the best romantic love match for a Pisces woman. These two water signs have a better understanding of her mood swings and sensitivity. Another Pisces might not be a good match since the challenges Pisces faces will be doubled. The relationship could either be a great match or a tragic one. Earth signs Taurus, Virgo, and Capricorn complement her and provide her a safe haven sheltered from some of the influences which she might not recognize are depleting her energy and emotions. Earth signs are great protectors of the fish and can provide form and structure to an otherwise fluid environment. No one fully understands a Pisces woman. You only get a glimpse of what she wants you to see and hides the rest from your curious eyes. She may be chatty one moment, and then silent and withdrawn the next. When hurt, she may retreat into the cold depths of her pain, but her forgiving nature will see her back to her warm self soon enough. Pisces doesn't hold grudges, even if she wanted to, her fluid nature defies such blocking of channels vital to her very existence. Just remember that her sensitivity to gestures and all those little things communicated without words are more important to her than anything you might say. Your actions are what she'll believe, not your words, so be careful how you treat her. If you bestow her with love and respect, honor her feelings and the many things she does for you, you'll have a long-lasting relationship that can withstand any tests tossed your way. At first glance, it may appear that Pisces is too soft and feminine to fend for herself, but that assumption is an illusion, just like the dreamy world where she often escapes. Pisces has a deep well of personal strength, resilience and capability. 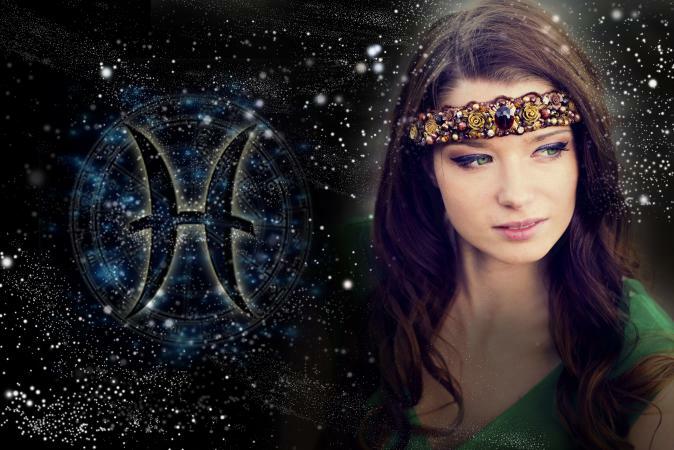 Pisces can be resourceful and is certainly strong enough to stand on her own two feet with assistance. The only thing she requires is direction. Once she discovers her true path, Pisces becomes a formidable force like the salmon fighting to swim upstream. That stamina and persistence is just one surprising ability a Pisces woman has, often cloaked beneath her gentle facade. Pisces is the twelfth sign of the zodiac. This means she's ascended through the zodiac wheel from one lifetime after another and has accumulated all of the knowledge and experiences of being each sun sign. She understands that she is a part of everything and that nothing in life is separate. It's why she's so empathic and connected to her emotions and those of everyone around her. Pisces is in the last incarnation of the zodiac wheel and even has a tinge of angelic dust on her eyelashes.